Number 55, come on down! Fair-haired, tall and slimly-built, Mark Buckley had a short yet notable senior career with the Blues between 1982 and 1985, during which he completed a family connection. Mark’s father was 116-game Carlton defender Brian Buckley, while his brother Stephen played six matches at Princes Park in 1980 after a long apprenticeship in the lower grades. Buckley is still a favourite of football trivia buffs to this day; in particular because he wore three different guernsey numbers in his career, and was the first Blue to wear number 55 in a senior match. He also wore number 10, and had the honour of briefly carrying the sacred number 4 for one game between the departure of Peter Bosustow, and the arrival of Stephen Kernahan. 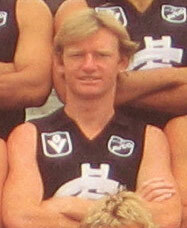 Like his father and brother, Mark began at Carlton with the Under 19 team. A natural left-footer, he grew into a dangerous forward who took often-spectacular marks and was a reliable kick for goal. At thirds level his thin build didn’t matter, but as he worked his way through to the seniors he was to find his lack of bulk something of a handicap. Before worrying about that, though, he celebrated a Premiership with the Under 19s in 1979, in a team managed by his father Brian, and coached by Carlton Premiership star Bryan Quirk. He was recruited from St Mark's, he had also played for Fawkner. The Old Dark Navy Blues dominated the VFL between 1979 and 1982, winning three flags while costing ourselves a fourth in the aftermath the Harris/Rice boardroom brawl. The team was as strong as at any time in our history during those years, so just gaining a place on the list was a creditable achievement. Mark had enjoyed a good, consistent year with the Reserves by July 1982, so when he was named to make his senior debut on the interchange bench for Carlton’s round 18 match against Footscray at Princes Park, it was a just reward. Buckley’s first game was an unforgettable experience for the youngster. Led by the dynamic Waynes; Johnston and Harmes, Carlton shredded the Doggie defence to kick 10 goals in the first quarter, and from then on, dominated the match. The Blues piled on the second-biggest score in our history; 30.21 (201) to 10.12 (72), as full-forward Ross Ditchburn helped himself to 6 goals, Ken Sheldon booted 4, and Buckley joined in the fun with two on debut. Mark played off the bench for all three remaining rounds of the ’82 home and away season, but was left out when the finals got underway. Three weekends later, Carlton claimed our third flag in four seasons with a gutsy, determined Grand Final victory over Richmond – a triumph that set the seal on that team as one of the best of all time. Buckley swapped to guernsey 10 in 1983, and burst into the new season in the traditional Grand Final rematch at Princes Park in round 1. This time, Carlton hammered the Tigers by ten goals, even though full-forward Ditchburn damaged a shoulder and was forced off the field just after half time. Buckley (who had taken a couple of good marks and kicked a goal during a brief run in the first half) was sent to the goal square in Ross's place, and set the partisan crowd alight by marking everything that came his way. He kicked five impressive goals in the second half that afternoon – including a pearler from an impossible angle in the forward pocket. That game showcased Buckley’s potential, but other teams weren’t prepared to concede him time and space like the Tigers did, and from then on he was closely marked whenever he was sent to the goal-mouth. When centre half-forward Mark Maclure was sidelined by injury mid-season, Buckley proved to be a capable replacement, although the team as a whole lost its edge and was bundled out of the finals in the first week by Essendon. That was the high-water mark for Buckley’s career, because in 1984 the arrival of boom West Australian Warren Ralph and the return to full fitness of Mark Maclure squeezed him out of the senior team for all but two games, both of which he started from the bench. He switched numbers again in 1985, taking on the number 4 worn with such distinction by Peter Bosustow, but only got to wear it once for the senior team – in a 17-point win over Richmond in round 8 at Princes Park. Sometime soon after that game, Mark decided (or perhaps was told) that he would get more opportunities somewhere else, and that his time at Carlton was up. In the following weeks while his future was decided, Mark finished off his career in style with the Carlton Reserves, kicking 16 goals in three matches before heading off to the Junction Oval to play with St Kilda. He added seven games and four goals to his tally with the Saints, and in 1987 rounded off his career with another four matches and two goals with the Brisbane Bears. Contributors to this page: molsey , Jarusa , Bombasheldon , PatsFitztrick , tmd1 , WillowBlue , true_blue24 and admin . Page last modified on Sunday 04 of November, 2018 20:24:02 AEDT by molsey. 1988 Rd 11 - Buckley still burnin'. 2009 - Top 10 Trades of the Decade - Heath Scotland.